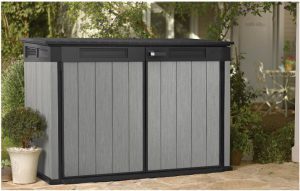 DUOTECH™ My-Shed simplifies turning garden escape aspirations into reality. Providing flexibility through a unique customizable resin manufacture enables to effectuate the construction of sublime garden summer house ideas with basic DIY skills. DUOTECH™ comprises a low-maintenance composition that’s resistant from decay & corrosion when exposed to the cycle of weather changes, even prolonged damp conditions, replacing future conservation issues with a cinch of a cleaning duty. The undemanding spray of a light hose down constitutes the mere operation to spruce-up DUOTECH™’s maintenance-free manufacture, a breeze upon comparison to wood. 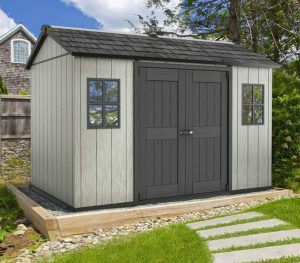 My-Shed transforms into the perfect peaceful home-office, tranquil art studio, man-cave’s gaming den or she-shed’s escape. Maybe a calm reading place is desired a stroll down the garden or a noisy kids games room situated away from indoors. From a private gym, Jacuzzi spar hut or music studio to the cosiness of an outdoor garden lounge; My-Shed provides endless possibilities. 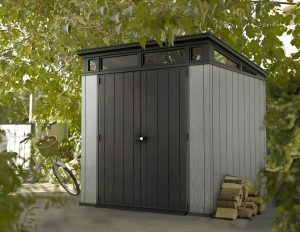 My-Shed regards an offshoot from Duotech’s hugely popular Oakland range of sheds, manufactured by Keter. 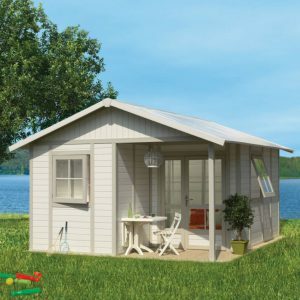 Spanning similar 7.5 x 11 ft dimensions to Oaklands largest model albeit with doors positioned across the length caters to organise storage on both sides further to creating your unique homely summerhouse design. 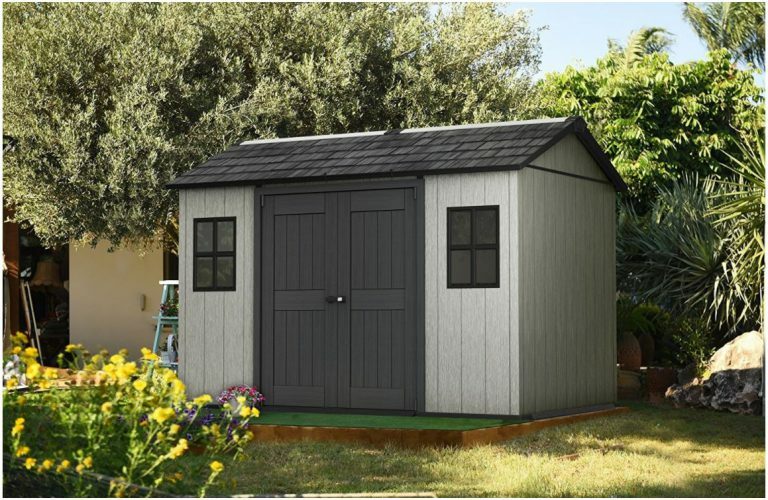 The 3 sheds making-up Oakland’s range all receive mighty fine feedback as a result of DUOTECH™‘s impressive customizable features, spurring Keter to design alternative low-maintenance storage solutions comprising the same manufacture. 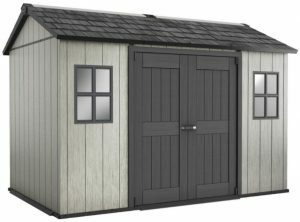 Inspect the various DUOTECH™ designs: Presently including walk-in storehouses, patio stores, low profile designs and deck boxes meanwhile Shed Sizes displays My-Shed’s competition. The fascia panels comprise double lined sheets of resin connected together by an internal corrugated structure. Improving robustness this way subsists the unsightly appearance dents display, a particular disadvantage single skinned walls and flimsy metal facades are susceptible to. Each wall panel is formed with tongue & groove edging simplifying construction meanwhile securing to the metal infrastructure enhances sturdiness. 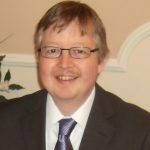 Full appraisal compliments how straightforward Oaklands assembly procedure has become. Simply slide the panels into the grooves, align & secure. Polypropylene mixed with a resin talc formula constitutes the make-up. Gorgeous rustic weathered tones exhibit throughout the silvery grey shimmer meanwhile the design epitomises wood to the touch derived by molding a textured grain effect embossed across the surface. Polypropylene boasts an environmentally friendly reusable material, unsusceptible to decay through weather attack from winter’s icy snowfalls to driving rain the composition does not succumb to rot nor rust when sat in damp conditions. Protecting the composition from the demise in appearance sunburn attack delivers to plastic through colour-fade and cracking, UV inhibitors stabilise & strengthen the manufacture, armouring Duotech to subsist against the forces of bleaching. A polypropylene constitution is poles-apart when comparing the preservation & nurturing duties wooden facades entail resulting from weather-attack. Polypropylene on the other hand remains unaffected, absent from on-going maintenance. Cleaning a DUOTECH™ facade couldn’t get anymore straightforward. We typically spray-hose our shed down whilst watering the plants during the summer evenings, freshening the appearance in a jiffy meanwhile detergent aids to remove anything ingrained. Customising Keter’s DUOTECH™ range involves straightforward procedures. The facade’s manufacture caters for drilling into, enabling the easy installation of shelving and securing hooks. Specially designed D-Clip™ wall anchors help attain a firm fix for hanging tools against resin walls for utility services whilst create more homely surroundings virtue of hanging pictures for summerhouse accommodation. Jigsawing sections out of the fascia panels to fit additional windows can be accomplished in a straightforward manner if more daylight is required, My-Shed is fully customizable to accomplish unique summerhouse accommodation including the installation of electrics & securing to the walls as the video up above demonstrates. 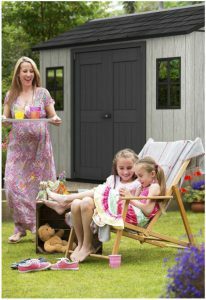 DUOTECH™ is designed paintable too, allowing a splash of colour to personalise the shed in your preferred shade, enables to accentuate a garden’s landscape with distinctive styling meanwhile decorating the inside in your exclusive colour scheme tailors to match personal styles. Combining pictures with cosy furniture generates more comfort & homely atmospheres. Acrylic emulsion paint is advised in either a gloss, semi gloss, satin or matt finish, colour options are endless and available at local hardware stores. Be aware the silver-grey facade is the only paintable part, the trim, doors and roof etc are just a polypropylene manufacture and not paintable. A painted surface may diminish over time through colour fade from sunburn attack however applying another coat after a wash-down & dry regards their only duty, decay won’t be an issue. It has to be noted that the white doors, white window frames and picturesque window-boxes displayed in the images below plus whether you are able to purchase additional windows etc, presently requires an enquiry. Ask the supplier for more information prior to purchase. My-Shed is new to market therefore supplies maybe limited. A sloping gradient in an apex style constitutes My-Shed’s roof structure. Effectuating an immediate rainwater run-off system the steepness avoids any form of puddle development meanwhile putting an end to internal dribbles at the walls connection, the roof panels jut out beyond the facade ensuring a dry interior is maintained. Twin lined sheets of polypropylene form the roof manufacture whereby a ribbed internal structure enhances robustness. The outer-layer is molded to resemble classic slate tiling, capping My-Shed off to stylish effect. Polypropylene provides the antithesis of roofing felt’s manufacture. Polypropylene’s resilience to structural demise remains unparalleled upon comparison, built-in weather defence ensures long-term survival without succumbing to decay meanwhile future roof replacements susceptible to yesteryear’s garden sheds are becoming a thing of the past. 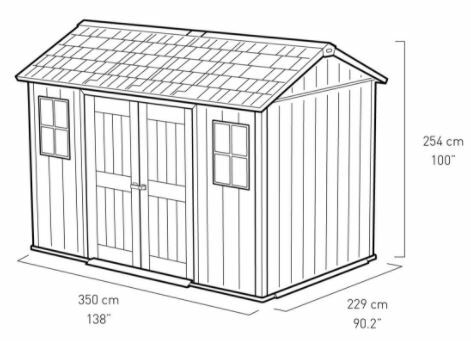 My-shed incorporates Oakland’s sturdy roof construction, able to support weighty snow-loads of 100 kg/sq.m. 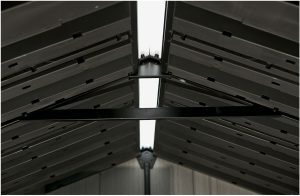 Dual walled panels augment stability meanwhile each roof sheet secures to the metal framework, undergirded by steel trusses stretching out across apex width delivering reinforced support. Embedded within the apex roof ridge lies a translucent poly-carbonate skylight strip to accompany the windows in illuminating plenty of natural daylight to the interior for the purpose of enhancing summerhouse living. Walking around inside Keter’s My-Shed reveals a spacious environment due to the 11 x 7½ footprint however the steepness of the apex reciprocates a lofty ceiling expanse inside, comfortable for an adult to roam around without any notion of a bent-over or hemmed-in feeling, rather a bright & airy room. Two poly-carbonate windows either side of the double doors escape glass manufactured accidents whilst their Victorian squared styling adds classic looks, especially when fitted with window boxes. Two strapping double doors manufactured from reinforced twin-lined weather-resistant polypropylene deliver substantial access, leave them ajar and welcome summer’s outside environment indoors to generate an unmatched home-office atmosphere. A quality padlock-able handle accompanied by a stainless steel locking system delivers access and security. My-Shed’s thickset resin floor arrives in panel formation, interlinking with accompanying sheets they secure together making up the base expanse. 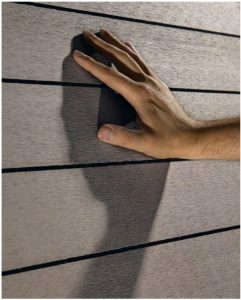 The wall’s fascia panels interlock within the floor’s perimeter enclosing the shed, preventing outside debris wafting through, blocks a pest’s scurry-way and stops rainwater puddling inside, thus maintaining a dry & spotless internal environment. Creating one’s own personal space by customising the interior delivers the opportunity to fit your own personal taste of flooring to suit the desired services of summerhouse accommodation. Carpets & rugs for instance coincide with cosy furniture, wood flooring probably enhances home-office equipment however there are no rules, My-Shed is destined for the creation of formal-to-quirky finishing touches. Due to the doors swinging out, fitting a floor is made easy as the depth doesn’t present an issue. My-Shed’s Assembly Instructions explain the significance of preparing a solid substrate for the facility to station upon which can be existing asphalt, tarmac or paving slabs further to laying concrete or constructing a decked platform however it’s best not to sidestep the importance of the foundations being level. I wish the sales sites would emphasise foundation importance, it’s imperative these rules are adhered to meanwhile raising the footings above a floodplain level is also advised to prevent the shed stood in water. A levelled base ensures a perpendicular stance prevents leaning stresses to one side, constructs the doors vertical alignment to operate their precise swings meanwhile delivers efficient panel alignment aided by the tongue & groove edging, Oakland Sheds receive rave construction reviews. The solid part of level foundations enable the shed floor to serve demanding pressures, the thickset resin bed is purposely strengthened to cope with the rolling weights of tractor-mowers if traditional shed services are required however their ability to survive & subsist the stresses require a flat solid surface. Eight embedded anchor placements are presented within the resin floor for rigidly grounding My-Shed to increase wind resistance levels thereby enhancing overall stability. A shed this size takes a fair amount of time for two people to assemble, there are quite a few steps to accomplish yet construction is made straightforward. The procedure requires following the order and implementing the steps illustrated in the instructions meanwhile telephone numbers for assembly help are also presented. There’s no doubt My-Shed exhibits the most delightful of picturesque appearances especially accommodating box planters below the windows either side of the double doors. Delivering the first paintable resin surface, My-Shed satisfies desires for those who wish to stamp their colours both indoors and out to accomplish fulfilling their own internal styling whilst accentuating with the landscape outside. Although most will customise the interior for summerhouse accommodation, many will leave the gorgeous silvery rustic tones as is. 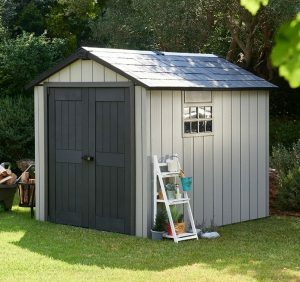 It’s weather-resistant, weatherproof, durable and sturdy requiring none of the yearly conservation issues demanded by wooden sheds plus it’s a cinch to spray-hose down. 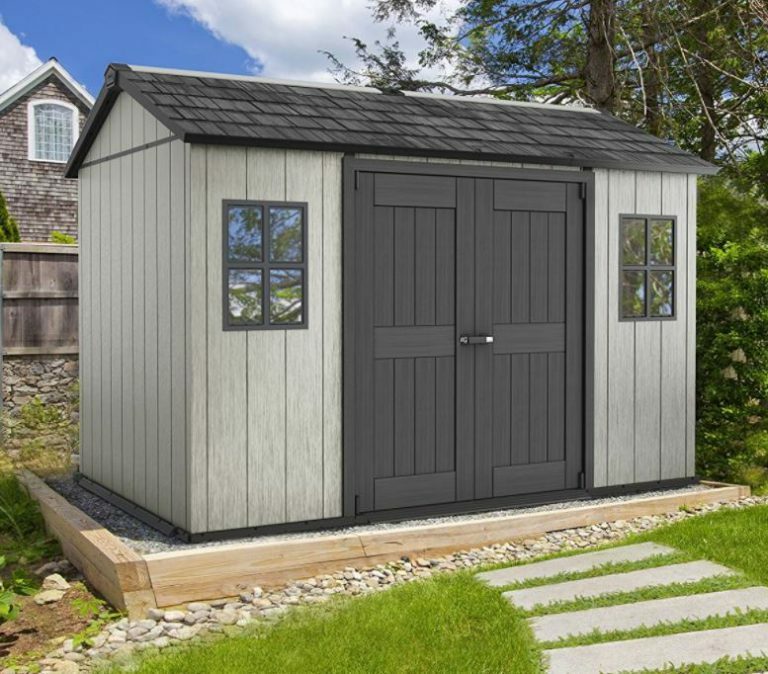 Although new to the market, My-Shed constitutes the same make-up as the highly respected Oakland range of sheds backed by 10 years of DUOTECH™ warranty. From a cosy lounge retreat, a peaceful home-office, art studio or reading room to the privacy of a personal gym. Maybe a stylish gaming den, music room or an outside play room for the kids; options are in-abundance. Duotech make dreams a reality, a few steps away down the garden. 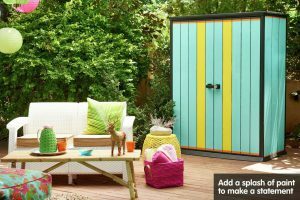 I hope My-Shed’s delivered plenty of garden summer house ideas for your outdoor summer living. Any related Duotech queries, please share in the comment section below. Please share Keter’s My-Shed. Thank you! Hi Margaret, thank you for messaging. 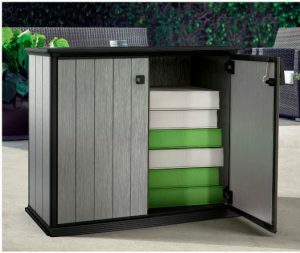 This Weather-Resistant Sheds website is purely a passion of mine whereby I write reviews on the ‘favourable’ and new ‘innovative designs’ of resin storehouses such as this Duotech’s My-Shed in order to help visitors make an informed decision prior to purchase therefore we don’t manufacture nor sell any sheds. 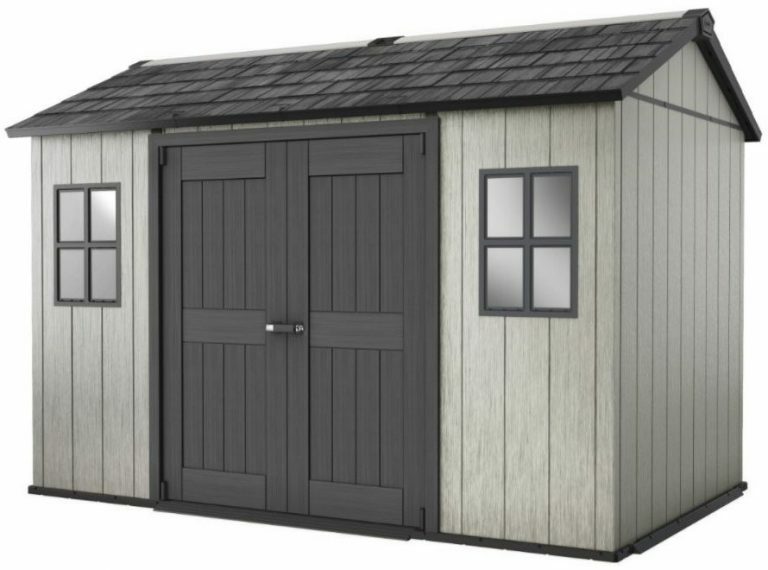 Duotech’s My-Shed is only available in this size, spreading 7.5 x 11 feet however there are 3 alternative Oakland sheds designed by Duotech that open from the front like the conventional garden shed but unfortunately one is the same size, the other two have smaller dimensions. Simon, I enjoyed reading this review for a garden shed. At first, upon reading the title “Quality Plastic Sheds” I had no interest in going any further because of the word “plastic”. However, the more I read the more interested I became. I love the fact that it’s paintable and can be customized. The only drawback I have is the size. 7 1/2 feet by 11 seems rather small to me. Does it come in a larger size to house lawn mowers, a small tractor, snow machines and the like? Thanks for dropping by to read about My Shed’s garden summer house ideas. The thought of switching a wooden shed for plastic raised my eyebrows too initially but having become over-whelmed with yearly conservation issues and the thought of escaping them certainly captured our attention plus the bonus of their easily cleaned surface. This DUOTECH™ range by Keter is fully customise-able, a first for a resin shed, providing the opportunity to make a statement of colour to enhance any garden surroundings. This is the largest dimensions Keter do in a resin style. 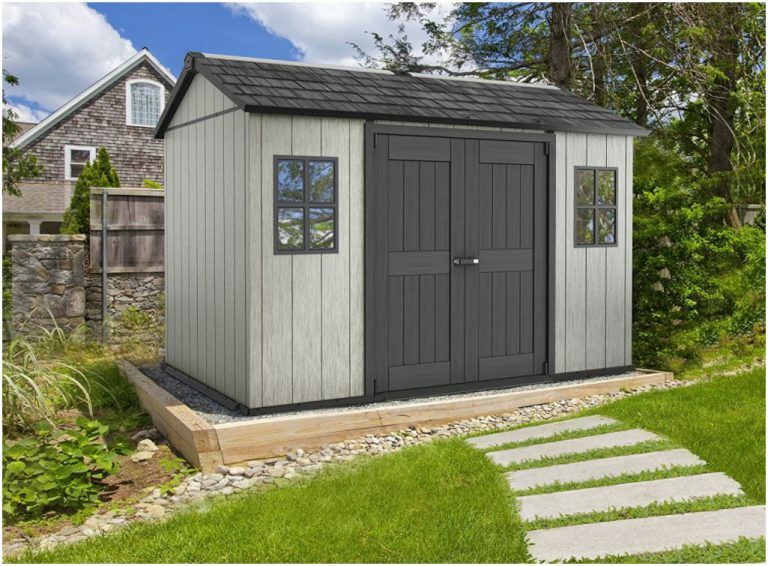 If you’re after a shed spreading across a larger area in a similar style, take a look at Lifetime’s 15 x 8 ft shed, however this isn’t paint-able. We always recommend measuring storage ideas and location spots against the internal & external dimensions. I really really like this shed. I like the fact that I can paint it and customize it. 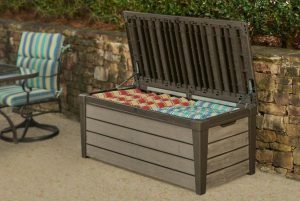 It looks like something I can use for storage and for a work shop. I know you did say they do take a little while to assemble. But with the instructions, if you follow them :), is it simple enough to do? Would it be able to be done with two people? This really is a great choice! 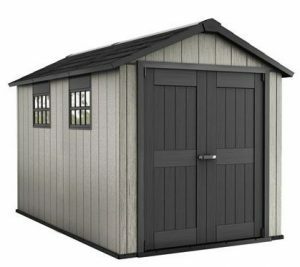 My-Shed is a large addition to the Oakland range having the same dimensions as the Oakland 7.5 x 11 ft Shed albeit with doors across the length instead of width delivering a more homely appearance with attractive Victorian style windows & boxes either side. They are fully customise-able, don’t they look fab in the video, designed to create your own personal space either for traditional shed services or for summer-house living. Oaklands do receive exceptional feedback on their finished construction and assembly procedure due to their tongue and groove formation panels, it’s a case of sliding into position, aligning up plumb and securing with screws around the metal infrastructure. To answer your construction question, they are very straightforward to assemble with 2 people if they are built from solid and levelled foundations however due to their size, the process does take time, it’s just a matter of working through each illustrated step and implementing what’s shown. These are very early stages for the My-Shed, finding sales sites at present is my only issue.